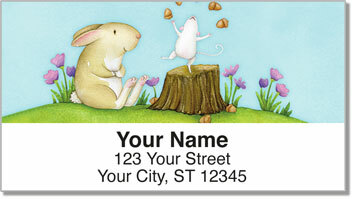 Show your love for your friendships with the storybook friendship of this mouse and bunny on our self-adhesive address labels. Beth Logan's excellent illustrations and eye-catching color make them impossible to resist as she chronicles these two furry companions roaming about their world, making unusual friends, and entertaining each other in a timeless and adorable fashion. 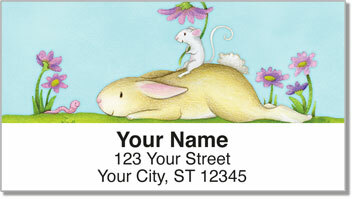 Next time your sending out a letter or a package to let your friends know you love them, give it a personal touch with these Mouse and Bunny Address Labels. 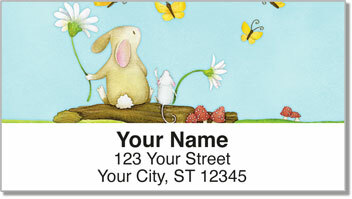 Simply peel and place to send something that's easy for you to use and adorable to look at. 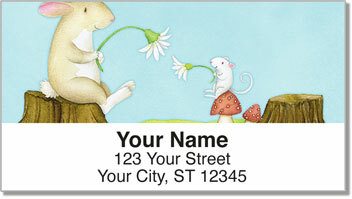 Get these gorgeous address labels today and you'll receive shipping absolutely free.